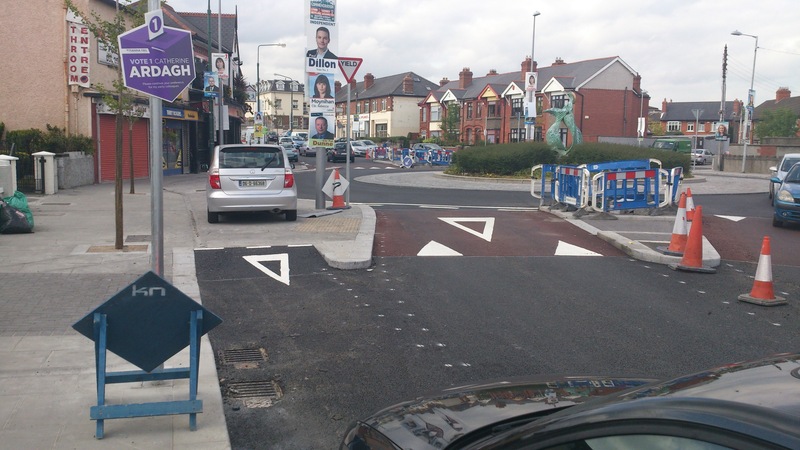 Anybody who looked at the previous design of the roundabout in Rialto Village, to the southwest of Dublin City Centre, would have noticed that illegal parking is a problem on the larger footpaths. The above is taken from just behind the silver car in the last photo — note how the black car is in a marked parking space — a parking space which was not there before the project but one which councillors and officials viewed as a great idea to place blocking access to a cycle lane. This is the city’s latest attempt to help all of its new cyclists get around the city that bit easier. Many councilors complain about people cycling on footpaths and the risk some posed to, for example, older people and the annoyance they generate in general. But clearly councilors were not getting enough complaints as they approved a project which puts cyclists on footpaths directly outside shop doors in a village centre. This yield sign painted on the path must be for cyclists traveling westbound contra-flow (illegally) on the new cycle lanes on the South Circular Road? Finally, cyclists on the shared use are put onto the Herberton Road leg of the roundabout just off the bend, at an acute angle. No need to deal with blindspots or awkward merges. 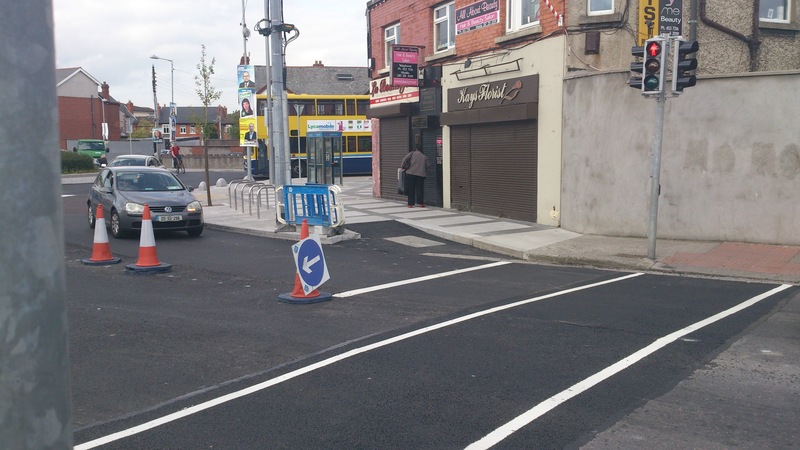 *We’d usually try to wait until the cycle path lines were painted before featuring a project on the Irish Cycle Facility of the Week, but this is fairly exceptional. The problems are already apparent and the temporary dotted markings make it fairly clear where the line markings are to be painted). EDITED: There were some errors made in updates of this page which were not supposed to be published. These are now corrected. This is shocking. In addition to dead-end cycle paths, new bollards (stone pilars) have been erected. No doubt this is in response to on-pavement parking, but in effect, it has brought a dead end to the cycle path. The only way to cycle around this roundabout, is on the (now much narrower) road ! Crazy. Stupid. Shocking. I regularly cycle this route and after one attempt to use the ‘cycle lanes’ I ended up stopped on the footpath and completely confused as to where I was allowed to go next. Staying on the road from now on. 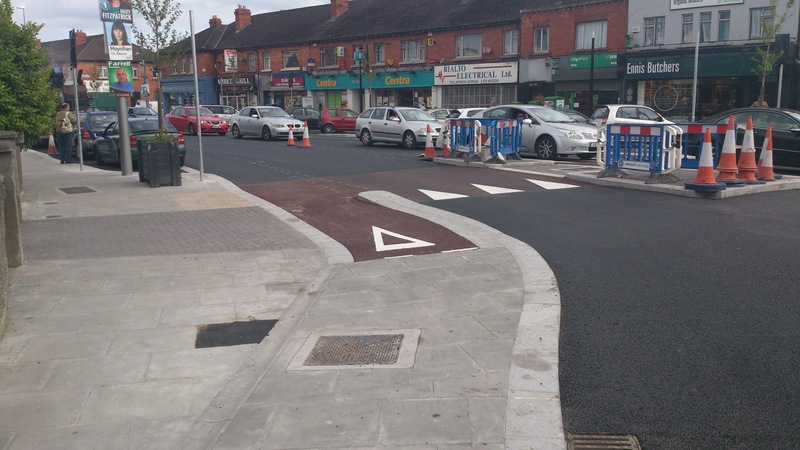 On a related note, I have a relative working in roads (not in Dublin) and I’ve often ranted about this roundabout, thanks for the photos to make my point. Law of unintended consequences, I suppose. And not much use for those new to getting about by bike, or who dislike taking the lane.